Would you fight your MMA Teammate ? Have you ever wondered how epic a showdown would be if Arab MMA fighters from the same team went at it in the cage? If all their support was to turn into rage in the cage with those they train with, share coaches with, stand by and spar with, all hell could break lose! Some of the best MMA fighters in Lebanon have trained and fought out of the same gym in the same Welterweight division, like Mohammad Fakhreddine (10-1-0), Mohammad Ghorabi (6-4-0), and Ramy Hamed (4-1-0). As time goes by they have moved into different associations, but what if they were to fight each other in a real test of forceful rampage skill, who would win? Fakhreddine vs. Ghorabi are two major names that everyone would love to see show case their skills in the same cage, yet it has never happened. What about the younger star Hamed up matched against either Fakhreddine or Ghorabi, how might that go down? With different records of experience, different styles and backgrounds in fighting, each with strong striking abilities and knowledge of each individual’s strengths and weaknesses, this would definitely provide fights unlike any other. 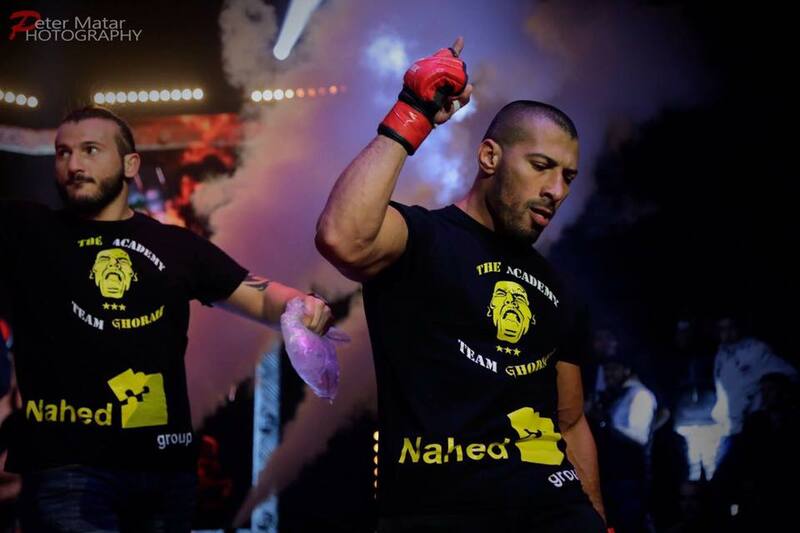 Or what about serious battles between Jordanian MMA teammates from Kingdom Fighters team. Ali Alqaisi (2-2-0) and Jalal Deaja (3-3-0) both fight in the Bantamweight division and Ezzeddine Alderabane in the Featherweight division. If any of these three were put against each other, would it be friendly sparring or massive destruction? MMA fighters coming from the same team help to develop each others skills by sparring with and pinpointing what needs to be improved. The give advice and strategic input for upcoming opponents. Most of all, they are usually friends who always push, support and strive to get them wins. If they had to face each other in a professional fight, it may be very difficult to separate emotions and bonds with the task at hand; to view the opponent on the opposite side of the cage as just that, not a friend but an object of destruction. Imagine what a spectacular experience it would be to see a battle of UFC international team members. Take the Brazilian team Nova Uniao for example. Some major names that have set the standards for the rest to follow have come out of this Gym. Current of former notable members include Jose Aldo (current UFC Featherweight Champion), Renan Barao (former UFC Bantamweight Champion), Junior Dos Santos (former UFC Heavyweight Champion). If they were to fight in the same weight category, what on earth would the clash of these icons create. One hell of a historic event. Two of the Nova Uniao team members have actually fought each other for the Bantamweight division title in Bellator 89, 2013. Eduardo Dantas was forced to go against his training partner and mentor Marcos Galvao for the first match to defend his title. Dantas knocked out his Galvao ending the match with Galvao on the floor. It was a well earned right to keep his title, obviously though it was not easy to see the destruction he inflicted to a friend, as seen when he burst into tears. Another example of great friends and teammates of Black House that went face to face in UFC Fight Night 30, 2013, due to Mark Munoz’s original opponent Micheal Bisping bowing out because of an injury. Lyoto Machida was the chosen replacement which was his debut into the Middleweight division, and won by knocking out Munoz with a kick in the first round. A lot of respect and affection between the two was displayed as Machida not only showed restrain as Munoz went down but also apologized for the professional hit as he was interviewed by Joe Rogan at the end of the fight. Of course there are other cases where fighters don’t exactly care for teammate that made for more gruesome bouts, irregardless of being associated to the same gym. would the family members have to physically fight one that knows every strength, weakness, training habits and reactions in the cage, but also all aspects of character as well. It would require incredible mental and emotional discipline to disconnect from the relationship tie, and go into machine mode. For example how would Nick and Nate Diaz handle each other in the cage? Given it most likely would not be as brutally engaged as it would be with random opponents, but it would be a display of incredible technical, and respectful sparring that would defy the usual MMA cage fights. NOTABLE MENTIONS OF TEAMMATE VS. TEAMMATE.